When Satoko Fujii was four, she was so shy that she begged to quit kindergarten. In response, her parents sent her to piano lessons. It was the first step in the self-discovery of a genuinely avant-garde musical artist. Subscribe today to JazzTimes magazine and receive reviews, industry news, profiles and much more! The Japanese celebrate a person’s 60th birthday as kanreki, a time when one circle of life is completed and another begins. Fujii honored the tradition with an audacious undertaking: the release of a CD of new music for each month of her kanreki year of 2018. She didn’t limit herself. 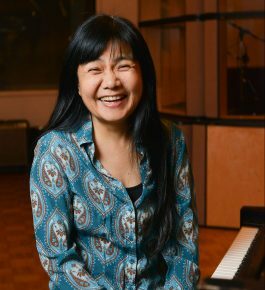 There is an album of solo piano improvisations that flirt with melodies from some of her classic compositions (Solo, released in January) and a pair of large-ensemble discs that revel in bold symphonic color (Ninety-Nine Years by Orchestra Berlin, from March, and a disc from Orchestra Tokyo in December). Other Fujii kanreki releases include the French-Japanese quartet Kaze’s fifth disc of dynamic caterwauls and croons (Atody Man, in February) and the debut of a new quartet, Kira Kira, which bristles with energy on more composition-oriented material (Bright Force, in April). The semi-new trio This Is It! (Fujii’s former Tobira quartet minus one) delivered a live club disc, 1538—the temperature, in degrees Celsius, at which iron melts—in June, then came back in October for Weave, a collaboration with the percussive dancer Mizuki Wildenhahn. Last but hardly least, a pair of discs from August and September tinker with sonic textures in a fascinating manner. The first is Mahobin: Live at Big Apple in Kobe, an improvisational quartet with Danish saxophonist Lotte Anker, electronics artist Ikue Mori, and Tamura. The second, Intelsat, is made up of duets between Fujii and Australian keyboardist Spence. Much of it is whisper-quiet, with both Fujii on piano and Spence on Rhodes often playing the insides of their respective instruments, although bells and gongs also make an appearance.